Facebook has also "unpublished" the InfoWars page on its platform for "using hate speech". Several episodes of Mr Jones' show were also removed from Spotify on Thursday for violating the music app's "hate content policy". He has also claimed that many of children killed in the 2012 Sandy Hook massacre were actors. The parents of two children shot in that ****** are suing him for defamation, saying he had made "false, cruel, and dangerous assertions". In a statement, Apple told Buzzfeed News: "We have clear guidelines that creators and developers must follow to ensure we provide a safe environment for all of our users. "We believe in representing a wide range of views, so long as people are respectful to those with differing opinions." 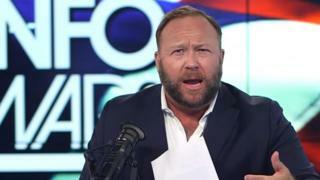 In July, YouTube removed four videos from Mr Jones' channel, which has more than 2.4 million followers. YouTube said it had "long-standing policies against child endangerment and hate speech" but InfoWars claimed the the videos had been deleted because they were "critical of liberalism".